It is ironic that after a long week vacation, I feel more tired than ever. I felt like I am jetlagging.. probably because I work at night shift, and now I am in the process of conditioning my body to follow this schedule. The whole trip is a blast. First, because I get to spend the week with my family. Destination: Bohol. This was not the first time I went there, but I was more excited about this trip because we had an itinerary on place. The flight with Cebupacific is rough. Flight was delayed for 30 minutes. We were in the plane on time but didn't leave on time. I am guessing that the captain pilot is a neophyte, as evident with the steep take off and bumpy landing. The hotel is 20 minutes drive from Tagbilaran City. Rough road. It is not the hotel I expected considering its price. What's more surprising is that, the room has no tv set and the room service is only until 8pm. Fine, the room is spacious, the view is nice and there's tub in the bathroom, but this hotel lacks the service basics. We were ready to cancel the rooms, but we would pay 50% of the total bill charge. So we got no choice but sign the guest information record. Let's talk about the good things. Family bonding. Swimming at the infinity pool. Lunch-outs and dinners (of course, should be Filipino cuisine). Visited Sagbayan Peak and Chocolate Hills again. It's just weird that they installed railings which block the great view of the hills. We went to see the tarsiers. But I was surprised to know that they no longer allow touching of this creatures. They don't want to be stressed out. And they say touch is therapy? Had a wonderful lunch at Loboc River, but I can't say the food is good. With its price of Php350 per pax, I can't complain no more. Visited the Bohol Phyton. And I meant, going inside the cage to have my pic taken. God bless my brave soul. I was itchng to go to Danao to try the Zipline, but my family is not that adventurous; so we went to Panglao Island instead. Alona Beach is heaven. 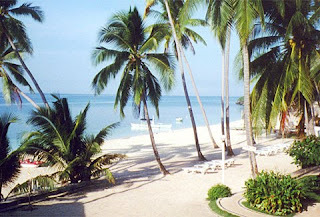 White sand (but not as powdery as the one in Madridejos, Cebu), blue sea and the scenes (guests and sights! ).